Hard apple cider with ginger and lemon juice. Crisp and light mouthfeel with a clean, dry finish that leaves a slight ginger heat. A knife slices through the skin of a lemon, the juice sprays out landing in a beautiful array on a plastic-wrapped table. Neat little pieces of ginger join the dismembered lemon to be dumped overboard into a vast sea of apple cider. They deserve it. Precise, and with purpose, to make the world a better place. If it’s to be executed, it must fit the code. The trophy is in the bottle. 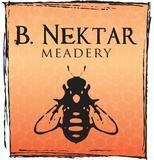 BORN IN B.NEKTAR.